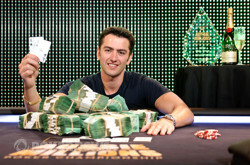 Congratulations Oliver Speidel, Winner of the 2012 Aussie Millions Main Event (A$1,600,000)! It started almost a week ago and now after one final grind, the 2012 Aussie Millions Main Event has come to an end. There could be only one winner and for the second year in a row, it is a Melbourne local. Oliver Speidel beat out a field of 659 players to claim the trophy, the glory, the pride and the $1,600,000 first place prize. The final table saw just seven players return with a chance at taking down the victory, but almost from the very first hand it was the Speidel show. 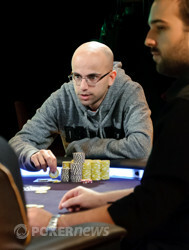 The first player eliminated was Yann Dion, with his demise coming when he got his stack in preflop holding and ran into Speidel’s . Next to go, in 6th place, was Bjorn Li. It was Mohamad Kowssarie who dealt the final blow to Li, with his staying ahead of Li’s . At this stage, Speidel was easily the most active player at the table and that continued until he knocked out Patrick Healy in 5th place. Healy tried to get tricky with on a flop and ran into Speidel’s . No help came on the turn and river and Healy was sent out the door. 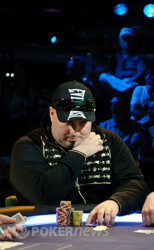 With four players remaining, Speidel had a commanding lead over the table, holding more than half the chips in play. Over the course of the day Speidel seemed to be the only player Kowssarie rumbled with and that proved to be his downfall as he ran his short stack into Speidel’s . Kowssarie held and a bricked board would see him eliminated in 4th place. Going into three-handed play, Mile Krstanoski was the short stack and his elimination would also come at the hands of the eventual champion. In that hand, Speidel shoved his monster stack all in from the small blind holding and Krstanoski made the call from the big blind holding . The flop put Speidel ahead and when the turn and river bricked, it was out in 3rd place for a A$610,000 score for Krstanoski. Going into heads-up, Speidel held a commanding chip lead and it looked like it was going to be very tough for Kenneth Wong to win. The first few hands of the heads-up battle went Wong’s way before the play slowed down for a couple of hands. Then, all of sudden it was over and Speidel had been crowned the champion. It was a 6-bet preflop all in from Speidel that saw Wong get his stack in with . It was if the stars had aligned for Speidel, with his slamming down on the felt to set up a huge climactic ending. 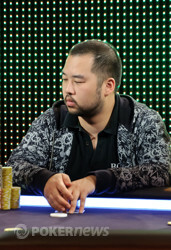 No help came for Wong on the last board of the night and that was it, the Aussie Millions Main Event was over. The atmosphere in the room was electric and it only got better when Speidel jumped on the table, laid on his back, picked up bundles of his newly won cash and rubbed it all over his body. There aren’t many chances in this life to have A$1,600,000 of cash in your hands and maybe if we got the chance, we would have done exactly what Speidel did. Either way, it was one of the most entertaining celebrations we have ever witnessed. It’s been a long journey, but PokerNews would like to congratulate Oliver Speidel on his fantastic achievement. If there was a player of the series award at the Aussie Millions, there would be no contest for Speidel. A huge two weeks saw Speidel finish 2nd in the A$1,000 No-Limit Hold'em Shootout event and then 6th in the A$1,500 No-Limit Hold'em Bounty event. And now he can add the Main Event title to that record. The name Oliver Speidel will not be soon forgotten! Kenneth Wong managed to gain some ground early in the heads-up battle but that is no longer the case as the last hand of the night has played out within the first 20 minutes of heads-up play. It all began when Oliver Speidel opened the pot to 160,000 from the button. Wong then three-bet to 485,000 in the big blind. Speidel then threw in a four-bet to 900,000. Wong wanted to make it five bets to go, throwing out 1,900,000. That was a huge portion of Wong's stack and Speidel almost gave a shrug as he said all in. Wong made the call and the two players turned their hands over. When Wong saw that Speidel had he looked a little taken back as his was well behind. This is when the excitement in the room really kicked into gear. There were shouts for nines from one side of the rail and cheers of joy from the other. The board ran out with no help for Wong. Don't feel to bad for Wong though, as his 2nd place finish is good for a whopping A$1,000,000. Oliver Speidel opened it up on the button and Kenneth Wong called as the flop was dealt. On the flop, Wong checked to Speidel who bet 200,000. Wong made the call and the hit the turn. Both players checked the turn and the completed the board on the river. This time Wong would lead, sliding out 300,000. Speidel made the call and then mucked his cards when Wong turned voer . The players are back in the room and back in their seats! By making the final two, both of these players are now millionaires. Kenneth Wong and Oliver Speidel have been reintroduced to the room and the cards are in the air! Let's crown a champion! The remaining two players are on a break until 7:00 PM local time. Here are the counts for when play resumes post break. In the small blind, Oliver Speidel raised all in and Mile Krstanoski called all in from the big blind. Speidel showed the and Krstanoski a dominating . The flop came down and it just must be Speidel's day as he took the lead with a pair of nines. The on the turn gave Krstanoski a flush draw, but he couldn't find a king or a heart on the river when the landed on the river. Krstanoski finished in third place for A$610,000 and the other two players are now on a 40-minute break before heads-up play resumes. From the button, Oliver Speidel raised to 160,000. Kenneth Wong called from the big blind and the flop came down . Wong led for 250,000 and Speidel made the call. The turn was the and paired the board. Both players checked. The river was the and Wong bet 350,000. Speidel mucked and Wong won the pot. From the button, Oliver Speidel raised to 160,000. Mohamad Kowssarie reraised all in from the small blind and Speidel snapped when action got back to him. Speidel tabled the and was ahead of Kowssarie's . The door card was the as the and followed. The turn was the and gave no sweat as Kowssarie was now drawing dead. The river completed the board with the and officially finished off Kowssarie.